One of the topics I’ve increasingly been asked to speak on is the development of a high performance model. I’ve worked and consulted in a variety of settings: full time staff on professional and collegiate teams, consultant to US Armed forces, collegiate athletic departments and national teams, product advisory, business board of directors, among others. I’ve also had the privilege to learn from some ridiculous leaders (having been a GA on Pat Henry’s LSU teams and then later a coach at the US Military Academy at West Point– the premier leadership academy in the world). Henry is the only coach in NCAA history to win both men’s and women’s track and field national titles in the same year; he has accomplished the feat five times with two different programs (LSU in 1989 and 1990 and Texas A&M in 2009, 2010 and 2011). As an astute observer of everything around me I’ve tried to find common denominators in my experiences of what it takes to succeed at the highest level – whether that be business or sport. 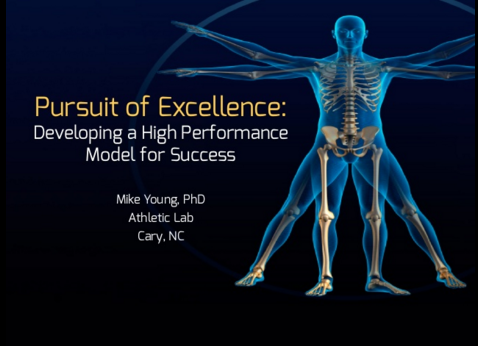 Here’s the slidedeck of a presentation on my template for developing a high performance model that I’ve given several times in the past year to audiences ranging from SOCOM to elite coaches and sports therapists. This roughly explains what we’re doing at Athletic Lab but also what I’ve attempted to bring to teams that I’ve worked with. As usual, I tend to have fairly spartan slides that are heavy on graphics but not on words. If you have any questions or thoughts please post to the comments.